Right now, this letter is competing for your attention with an editorial, a much more inspiring letter from President Leebron and your syllabus week hangover. However, we will soon be competing for your readership against schoolwork, your friends and your overcommitted schedule. This isn’t a challenge we take lightly: At both a national and a community level, journalism is necessary more than ever. While continuing our tradition of relevant, timely journalism, we’re working on expanding the breadth and depth of the Thresher’s coverage. To this end, we’re launching a Spotlight section of the paper which will focus on individuals, organizations and events on campus that might not be covered by our traditional news, sports, and arts and entertainment articles. 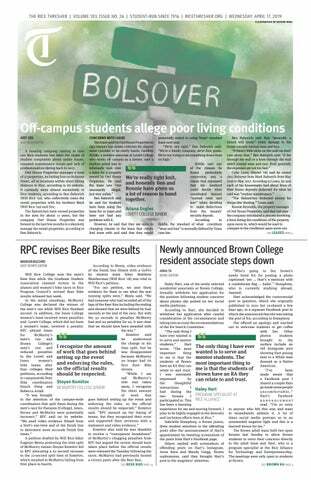 We’re also adding video and online features that supplement our print stories and bring news of campus happenings to you in more ways. The Thresher is run by Rice students and published for Rice students, and we want our organization to reflect that in its accessibility. The Thresher’s mission is not just to provide news to the student body. We also aim to provide a working place for those students who are interested in journalism — particularly since Rice still does not offer journalism classes in a time in which it is vital to cultivate the next generation of journalists. If you’re interested in journalism or media, whether as a hobby, career or simply a means of being involved in your community, sign up to join us. Believe us, we’re not even close to professionally trained journalists, so no matter what your level of experience we could use your help in writing the first rough draft of Rice’s history. The last part of the Thresher’s mission is to serve as a community forum, as a place for your voice. So that’s our request to you: Get involved. Speak up and send us your opinion pieces. If you like (or don’t like) something we’ve published, write a letter to the editor — or just come talk to us!